In the early 1890s, demand for Rocklin’s light-gray granite building stone grew steadily and Rocklin’s quarries were at peak activity. Rocklin’s railroad roundhouse employed 300 people and businesses flourished along Granite Avenue (now Rocklin Road), Front Street and Railroad Avenue. But periodic fires continued to plague Rocklin’s downtown business district as they had since the late 1860’s. In 1893, as a nationwide economic depression was forming, fire consumed 25 business places from the Trott Hotel (now the Crossroads Church) southward along Front Street. An equally disastrous fire a year later flattened the business block on the opposite side of the tracks along Railroad Avenue. It was in this context that Rocklin Judge John H. Gregory convened a series of meetings in the upstairs room at Porter’s Saloon in the spring of 1894 for the purpose of forming a Rocklin Fire Company. 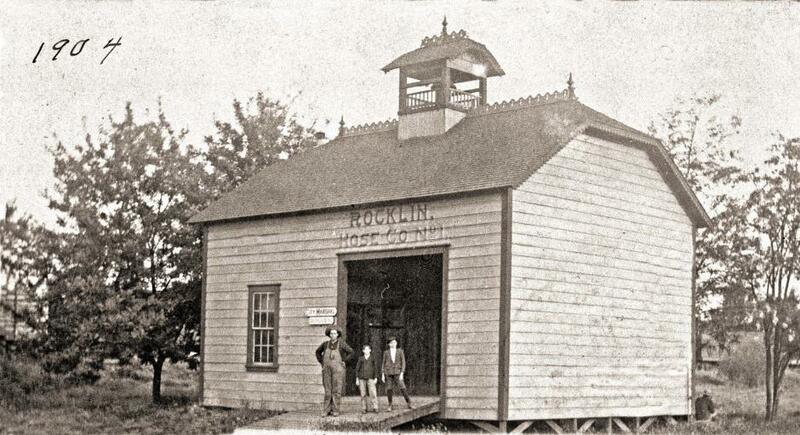 At the third meeting, on June 4, 1894, each of seventeen men paid a $2.00 initiation fee, elected officers and founded Rocklin Hose Company Number One, Rocklin’s first fire department. The group elected Irishman William J. Byrne as company foreman, Rocklin’s first fire chief. Every man was an unpaid volunteer. The company’s fire rig was a two-wheeled hose cart stored in a barn-like garage in the south side of Rocklin’s first City Hall on Front Street, on the exact spot of today’s Old Saint Mary’s Chapel. The cart carried a 100- 150 foot reeled fire hose. In some American cities in the 1890’s and early twentieth century, neighborhood fire alarm boxes were linked via telegraph-like circuits to firehouses. A person spotting a fire rushed to an alarm box and pulled down a handle sending a location-coded alert summoning the fire company. But Rocklin employed a fire bell located near city hall for this purpose. A person spotting a fire would walk, run or travel on horseback, possibly as far as a mile, to pull the fire bell rope to summon the fire company. A person from the east side of town might have to wait for a train to pass before crossing the tracks to pull the rope. On hearing the bell, fire fighters rushed to city hall, rolled the hose cart from its garage and moved it quickly to the fire. Sometimes they ran with it on foot. Sometimes they paid as much as $1.00 to the owner of any nearby team of horses that they could recruit to pull it. The firefighters elected each other to pre-assigned duties. At the fire site the hydro man connected the hose to the closest hydrant. The cart men pulled the cart ahead to unreel the hose. The nozzle man connected the nozzle to the hose and signaled the hydro man to open the hydrant. The nozzle man was especially important in the process. He sometimes ran to the fire alongside the hose cart cradling the nozzle to ensure its safe transit. His special skill was in attaching that nozzle quickly and squarely to the hose end. Wealthy nineteenth century quarry owner and land broker John Mantyla was a nozzle man. The fire company practiced twice each month to minimize time needed to “show water” at the nozzle. In 1910 quarry owner Adolf Pernu offered his quarry whistle as an alarm bell substitute for east side residents, and later the hose company installed a fire siren east of the tracks and across the street from today’s Rocklin rail station. But Rocklin historian Ruben Ruhkala doesn’t remember that Rocklin ever used a neighborhood alarm box system. He noted that, because of Rocklin’s cumbersome alarm system, houses northeast of downtown would sometimes burn to the ground before the hose company could respond. Rocklin’s early twentieth century fire fighters addressed each other as “comrade”. They met for business meetings at least once a month, mainly in the city hall’s hose company facilities. Meeting minutes show that discussions of fire suppression experiences and other fire-related topics occurred only twice in the 21 year period from 1894 to 1914. The men were probably heroes in the community. Newspaper accounts show that they fought many fires in those early years. But their main concern, discussed at length at most business meetings, was the maintenance of a dance platform and the conduct of July 4th Firemen’s Balls and other dances. Sometimes they scheduled dances as often as weekly, on Saturday nights. The meeting minutes show that the hose company paid to have the dance platform stored away in the winter months and that they probably located it at different downtown sites each year. In 1910 the hose company formed a separate corporation to profit from renting out the platform for dances and other uses, including roller skating. Ruhkala remembers a 1920s era platform for both dancing and roller skating on the Railroad Avenue hill across Rocklin Road from today’s Rocklin rail station. By the early 1930s Rocklin’s volunteer fire fighters had acquired a four-wheeled fire cart that they sometimes pulled with an automobile. They acquired their first motorized fire unit, a Dodge VanPelt, in 1936. This 1936 Dodge is proudly stored at Fire Station 23 today.